For a long time, now, my family have frequented a certain Chinese/Asian buffet house. They have great food, and the people who run it are wonderful. We love their more traditional Chinese dishes, and we also love their sushi. Brendon particularly likes their unagi. They have one dish that I love, that I had vowed to attempt. I don’t know just how authentically Chinese it is, but I love the taste! I also vowed that when I attempted it, I would not duplicate it, but would rather explore it on my own! Because there would be relatively little time once the cooking got started, the first step was to prepare the cheese topping. I just added all the items on the list together and mixed it upwith a fork. Because of the ingredients I chose, it really ended up being much more Mediterranean in flavor, rather than Chinese. Still, I think it tasted great! I don’t really remember the exact amounts of each flavoring item. I added things at the top of the list in slightly greater quantities than the things at the bottom (chili powder being the least of all), but really, I just mixed it all and tasted it as I went. While I did add some Cheddar to the overall mix, I didn’t add much, as I knew that more would be sprinkled on top later. 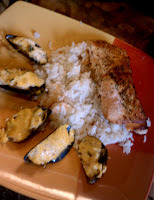 The coals were already started for the salmon, so I didn’t have to get anything set aside special for this dish. I just had to make sure that there were enough getting white to accommodate. While that was happening, I started to clean the mussels. I got them into my sink, and scrubbed each one down, on both sides of the shell, with a plastic brush. Many of them had a little stringy substance dangling out between the two shell halves. This is called the “beard”, and I scraped that off with a knife. I’d read to remove those that were opened. The instructions said that those were dead already. That’s a little tricky to say, because there were quite a few that were slightly opened, that would close up again after we had separated them out. I guess those ones weren’t so dead. There were many, however, that were quite clearly open, and quite clearly dead. I removed those. There were a lot of them to clean. About half-way through the process, I got the water and the cider in the bottom of the 12” Dutch oven, and I got that started on the coals, covered. I wanted to get it boiling. 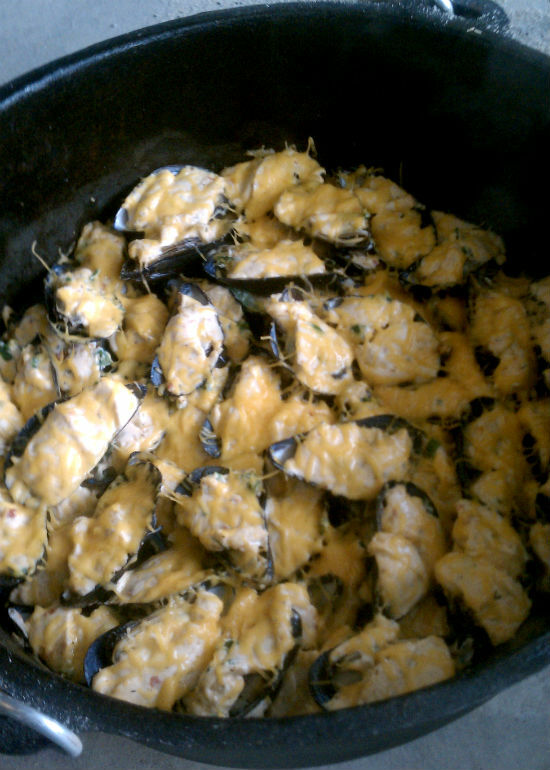 By the time I was completely finished cleaning all the mussels, it was boiling. I just unceremoniously dumped them all in, stirred them up a bit, and closed the lid. It didn’t take long, maybe ten minutes, to steam them open. I’d read that you shouldn’t overcook them, especially at this stage. I brought them in, off the coals, and drained them in a colander, retaining all the liquid for the rice. First, I pulled the shells open. Usually, one of the shells (the “top”) was free of meat, and the other (the “bottom”) held the mussel. I broke them apart, and discarded the top. Then, I took an knife and ran it under the meat, cutting the attachment between it and the shell. There’s one spot where it clings pretty tight, and it makes it much easier to eat if that’s severed. Still, I kept the meat in the shell bottom. Next, I spread a bit of the cheese mix onto the shell and over the meat. Not too much, it’s not there to smother, but to complement the meat. Finally, I placed the shell into the bottom of the 12” Dutch oven. I kept repeating this whole process until they were all done. There were a lot of shells, so I had to pack them in pretty tight. Finally, finally, I sprinkled on a layer of grated cheddar. I put on the lid, and set it on some coals to bake. Now, keep in mind that while I’m doing all of this, I’m constantly checking on the coals and the chips for the smoking salmon, and making sure that there are plenty of coals in the replenishing fire for the mussels. I also took some time during the prep time to set the rice. I measured the liquid I had drained off the mussels after the steaming. I had read that the mussels would release a lot of their own liquid as they cooked, and that would be a good flavoring broth. That, combined with the water, and the cider, and I had just under 2 cups. A little more water topped it right off. This, along with 1 cup of rice, went onto the coals to cook. A little bit after I had set the mussels on to bake, I could see the steam venting from under the lid of the 8” Dutch oven. I let it go for about 5 more minutes, and then pulled it off the coals to finish steaming in its own residual heat. Don’t take off the lid to check it! The mussels in the 12” Dutch oven didn’t bake long. You don’t want to overcook the meat. You just want to heat up the cheese mixture, and melt the cheddar on top. I let it go about 10-20 minutes from the time I put it on. I served it up with a few mussels on the plate, next to a bed of the rice, with a big cut of smoked salmon atop the bed. It looked and tasted delicious, and I felt like I had really accomplished something. I had done two dishes, one with a new technique, and another with a new main ingredient, neither of which I had ever tried before, and they were both successes. That’s a good, good feeling! With this profitable data about the medical advantages of fish, customers are generally uninformed of changing degrees in the nature of the fish they buy. "The Best of the Black Pot"